First off, we need to say goodbye to one of our design team girls - Jan Radu. Jan has decided to step back from being on the team to focus on family - a perfectly reasonable excuse, right? *smile* So, we'd like to take this chance to thank Jan publicly for all her fantastic creations - we will certainly miss having you on the team. For this weeks challenge we have a clean & simple sketch you're going to love! Danielle has put this sketch together and it's certainly one I will be going back to time and time again for inspiration - it's so versatile and we can't wait to see what you amazing paper crafters are going to show us this week! 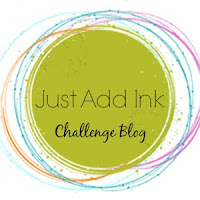 Just Add Ink 44 - A Colour Challenge! We Stamp For Lara FREE PASS Winner!